You love the game of Tetris on every platform, from your computer to your GameBoy to your TI calculator, so why not enjoy it in brilliant color on your Casio Prizm calculator? Featuring fast-paced gameplay, four play modes, high score tracking, and much more, this game is sure to be a permanent addition to your Prizm. In Marathon mode, try to complete lines for as long as possible as your score and the speed increase. High Speed mode ups the ante with faster drops at lower levels. If you want to start out in a bad situation, try Touchdown mode. With Collapse mode, you can set up giant stacks of tetrominos to score many lines at once. And to really torture yourself, see how long you can last with no line pieces in Sadistic mode. 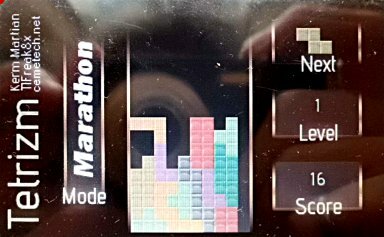 A few months in the making and a mere 185KB, this highly-polished game is a must for your Prizm, and incorporates thorough research into the original versions of Tetris to provide a fun and accurate gaming experience. Although I wrote almost all of this game, a special hat-tip to my coauthor tifreak8x for his testing and motivation, and to the other Cemetech beta-testers for their detailed feedback on beta versions. Cool stuff! It's fun to play. The song in the video is a different version than I've usually heard. Thanks, comic; glad you enjoy it! I hope that programs and games like Tetrizm will continue to drive more programmers and users to the Prizm. I'm impressed by the graphics. Did you implement any sort of compression for them, or is it all uncompressed? The only sort of "compression" I did was manually close-cropping the pieces of the interface. For example, the main screen is a left side, a right side, and a rectangular gray fill in the middle. Thanks! You're most welcome. You can also quit straight to the Prizm's main menu without the Pause, though, which in a way is sort of a pause. ooh, very smexy. the only thing i miss is having a drop shadow. i know it's more authentic that way, but it still helps on a small screen so you don't accidentally drop a piece on the wrong spot. Mm, yeah, drop shadow would be nice. It would be cool if that were toggleable. Thanks, everyone! Yeah, I thought about a shadow of some sort, but I figured it would make it way too easy. I have to try this out now. Yeah, I tried to GIMP it out, but it just looked awkward. I took your recommendation about changing the controls, by the way. Thanks, I will look at it later on. Yes, it is very fun. Thank you for suggesting it! Edit: Yes, I researched the official version, but in the end I decided to make my own twist on it. For those of you who have gotten an fx-CG50, I have updated Tetrizm for the new calculator. It runs very smoothly and quickly. © Copyright 2000-2019 Cemetech & Christopher Mitchell :: Page Execution Time: 0.107780 seconds.